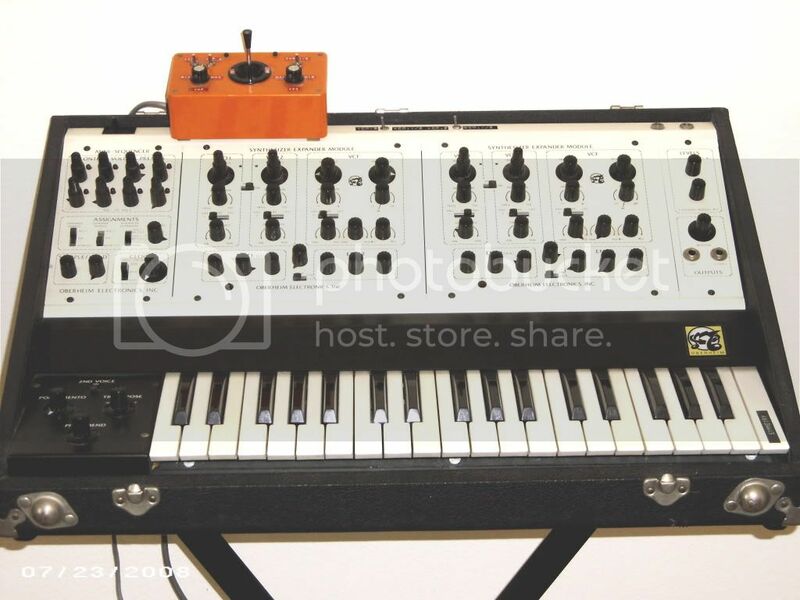 I have an Oberheim 2-Voice, which I have owned since the mid-70's. It is in very good shape, physically and musically. Does anyone out there know what this synth is worth? Thanks. I don't see these too often on eBay, but just judging from what I've seen, I'd say it's worth $2K - $2500 depending on condition. Just the SEM modules theselves (without chassis & PSU) are fetching $800 - $1K each. I picked up a TVS-1 sans sequencer earlier this year for $1K thanks to a tip from a fellow member of this forum. It did need a little work, and I put another $300 into it with the help of my local tech. Thank you so much for the reply. Mine is identical to yours, but with the sequencer module. Where and who is your tech? I use Audio Electronics here in Dallas. My TVS-1 is the only one I've ever seen without the sequencer. Since you seem to have good knowledge of these units, mine is Serial #0031. Would you know how many of the TVS-1's were made, and when this one was manufactured? The manual has a date of 8/24/76. If you know of sources for this kind of info, please pass it on. 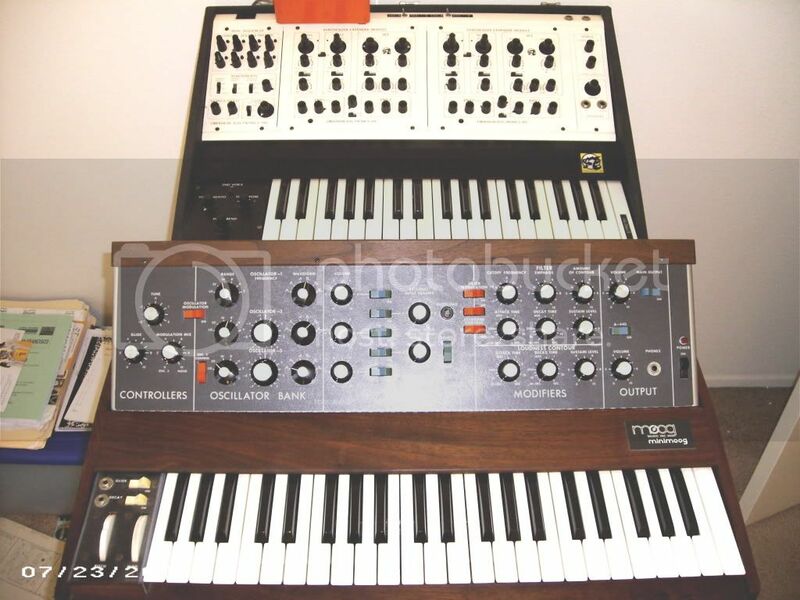 (I also have a Model D Minimoog, but I know much more about that unit. 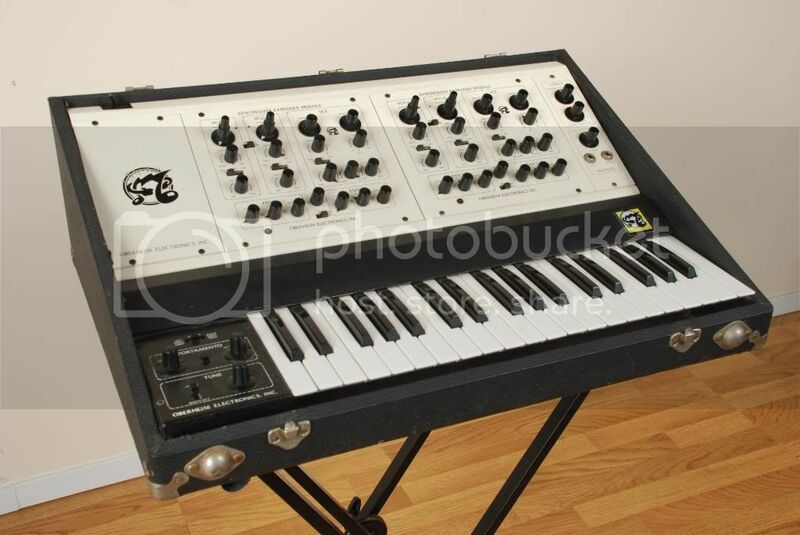 I bought it directly from Moog in the early 70's) Thanks. Sorry, I do not know such information. I think there are a couple of members here that do know production dates and such (I've seen numbers and dates for other instruments posted in other threads), but I don't remember who they are. I'd like to see your synths. You can post a photo of your Obie here or all of them in the Pictures thread. I have the TVS-1, a Minimoog, a Yamaha SO-3, and an Arturia Moog Modular. I use the Mini, the Yamaha and the Arturia Modular for gigs, on a 3-stack set-up. The Mini on the bottom, the Yamaha in the middle, and the keyboard controller on top, with a touchscreen monitor on the left for the Moog Modular....great fun. Many people use Flickr for photo hosting, but I like to use Photobucket. It's free and it also generates the necessary code to cut and paste your image into eBay listings and forums. That setup does sound like great fun. I guess the TVS would be a bit cumbersome live ? Don't forget to check the VSE page for the TVS . They list production as 75-79. Do you have the lid/cover? That would be a plus. The keyboard electronics and controls(black area-left of keys) may look different than what you see on Zs. I just mention this because of your early serial number. I believe the early version was more analog while the later version is listed as digital. Mine(and likely Zs) has more chips or ICs on the pcbs. I don't really know the full operational differences, though . Sometimes, the production date is stamped on the SEM pcb. When looking at the back of the SEM, it's usually near the bottom center of the (closest)pcb. I haven't looked for one on the sequencer. we have a 2 voice without a sequencer as well, so yours isnt the only one. there must be quite a few out there. Here's a photo of the Obie. I am using Photobucket for the first time. Yes, it does have the cover. The left-hand controller is a little different than yours, and also, there is the orange control box. Additionally, it has some modification switches which allow combinations of VCO's 1 & 2. I'm not sure how many 2-voices were made but the highest s/n I've seen on one is #547. I don't think they built many more units than that but I may be wrong. Given that the first 2-voice shipped in Aug 1975 along with the fact that your unit has such a low s/n, I'm suspecting it was manufactured in the fall of '75. I've only seen a handful of 2-voices like yours, incl. the one pictured in the first ed. of the service manual. I am new to this site, but I am sure glad to have found it. It seems like a good bunch of people who know their stuff. I love the finish on the Mini. Very nice, thanks for sharing!